YOU'VE seen them. They're everywhere. With market saturation that even Starbucks couldn't dream of, and far less likely to leave a bitter taste in the mouth. It's hard to be all things to all people, but in most cases compact SUVs seem to be giving buyers exactly what they want - at least, that's what the sales figures say. The enthusiasm with which the carmakers have turned to this rapidly growing segment now means the biggest battle for designers, engineers and the like is finding a point of difference from the rest of the pack. At the sharp end of the market - an area obviously mostly populated by German brands - this is perhaps the most obvious. BMW's ever-expanding range of X models covers off everything from the shopping basket buyer to those who want to show off with triple-turbocharged monsters; Audi's also injecting a bit more performance into its line-up with cooking "S" versions, and even a stroppy "RS" take on its little Q3. Mercedes-Benz has now thrown its hat into the compact SUV ring with the GLA - a slightly different approach from the others with a body style closer to being a wagon than the traditional crossover style - and it ranges from a little front-spinner to a very bonkers AMG version, the GLA 45. The GLA is based on Mercedes' front-drive architecture that underpins the A-Class and the slippery little CLA coupe, and is extremely important to the brand. Available from April, prices will start from $47,900 for the front-wheel drive 2.2-litre GLA200 CDI diesel. That will be followed in July by the $57,900 GLA250 powered by a 2.0-litre turbo four cylinder petrol with up to 165kW/350Nm output and 4-MATIC all-wheel drive. Sitting atop the range will be the GLA45 AMG with a hand-built 265kW/450Nm petrol turbo for $79,900, but that won't be here until September. Between this trio, the platform-sharing B-Class - and one more "mystery model" that will be revealed this year - Mercedes has a more complete small car offering than ever before. Last month the international launch was held in Granada, Spain, where we got our hands on two models on a variety of mountain roads, motorways, mad Spanish cities and even a bit of an off-road jaunt. While this, like all crossovers, clearly signals its availability for light mud duties, the reality is that most won't see much more off-road action than a verge in a leafy suburb somewhere. Mercedes understands this well enough not to bother offering a special suspension lift kit as an option here. It does, however, have a couple of nice off-road settings: a magic button that adjusts the transmission and 4MATIC all-wheel drive system to better cope with the bumpy stuff, and hill descent control, which slows the vehicle on super-steep bits to maintain maximum grip from each wheel. The thing that's really going to work for the GLA is that it looks more like a muscular hatch than your average compact SUV. It's not too lofty, the overall design is very sporty without looking comical and the smooth, flowing lines give it one of the slipperiest profiles in its class. On the inside there's a welcome omission of off-road pretender design cues, with the same modern and uncluttered dash design that carries through from the rest of the A team. A large, curiously non-touch screen dominates the centre dash, controlled by a console-mounted jog wheel that, once you've used it a couple of times, becomes almost intuitive in use. Large round air vents hint at its branch on the SLS supercar's family tree, and sporty seat designs make for a comfortable ride with enough support for bursts of enthusiasm or when avoiding Spanish locals taking early siestas at the wheel. The GLA is obviously not going to be chasing G Wagens across the Sahara, but proved fairly capable on the short off-road course we tackled. The 4MATIC system proved its worth, giving steady and remarkably comfortable progress with very neatly meted-out power that allowed good climbing abilities without excess wheelspin. On the road, though, it was a testament to just how much progress Mercedes-Benz has made on its front-or-four-drive chassis since the teetering A-Class of old. The roads of southern Spain were beautifully constructed but did take a bit of effort with steep descents and winding runs through mountain passes punctuated with contortionist-tight corners that really put the GLAs through their paces. The biggest challenge for Mercedes-Benz with the GLA Class is actually going to be supply. And just like the A-Class and CLA....expect a line-up. GLA200 CDI: 100kW and 300Nm of torque from the 2.2-litre four-cylinder turbocharged diesel engine, front wheel drive, consumption of 4.6 litres/100km (combined average). GLA250 4MATIC: 155kW and 350Nm from the 2.0-litre turbocharged four-cylinder petrol, all-wheel drive, consumption of 7.0L/100km. 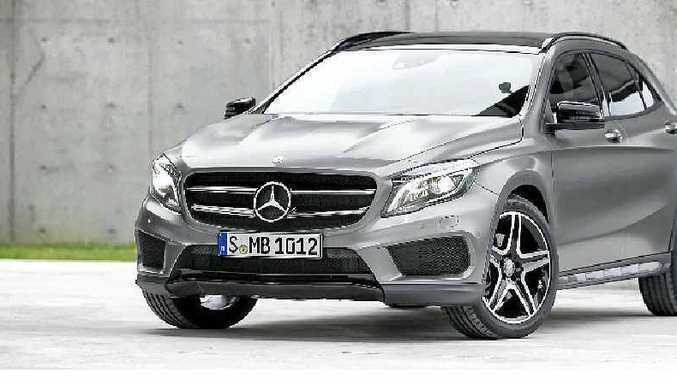 GLA45 AMG: 265kW and up to 450Nm of torqu from the 2.0-litre, four-cylinder turbocharged petrol, all-wheel drive. Bottom line plus on-roads: GLA 200 CDI: $47,900, GLA 250 4MATIC: $57,900, GLA 45 AMG: $79,900.